My photography is more avocation than vocation. While my real job is pretty flexible, the fact of the matter is that I can’t always just head to Yosemite anytime the weather looks interesting. If you’re a regular reader of this blog you’ll know that weather, generally bad, plays a huge role in my shooting style. This scene is a great example. As one of Yosemite’s most frequently photographed views, Tunnel View is a grand vista. It’s one of the most iconic locations in the park, and for good reason: it’s an amazing sight. Most of the time I don’t even shoot from this location but it’s absolutely the best place to be to get a broader understanding of what is going on in the park. From the seat of your car you can see mist forming over the meadows or be among the first to see a storm starting to clear. The the case of the later, it’s almost impossible to leave the camera in the car. Getting this shot was the result of a gamble that paid off. One Monday, last March, I was checking the weather forecasts for Yosemite. A storm was forecasted to hit over the weekend with a snow level of 5000. At only 4000 feet the valley floor would, most likely, see only rain. With the weekend approaching the forecast started to look more promising. Snow levels remained at 5000 feet but the predicted low temperature kept dropping. Friday evening, on a hunch, I made a reservation for Saturday night in Curry Village (an unheated tent cabin if you’re keeping score). Saturday morning I threw the family in the car and we headed to Yosemite. As expected we were greeted by rain in the park, turning very heavy after dark. After a nice dinner at the Mountain Room, we tucked ourselves into our sleeping bags and fell asleep to the steady pounding of rain on the tent. Ironically it was the best nights sleep I’ve ever had at Curry since the rain managed to drown out the noise from neighboring tents. During the middle of the night, that pounding on the tent turned to a soft flutter. It was snowing. Waking up to fresh snow, in Yosemite, is like walking into a fairy world. I couldn’t wait to get out shooting. After fighting with 3 sets of snow chains, a story not fit for young eyes and ears, I was off and headed to Tunnel view to survey the park. The occasional snow flake was still falling but it was obvious that the storm was breaking. Iconic view or not I had to shoot it. By early afternoon the snow had all disappeared so we piled into the car and headed home. If only every plan worked out as well. 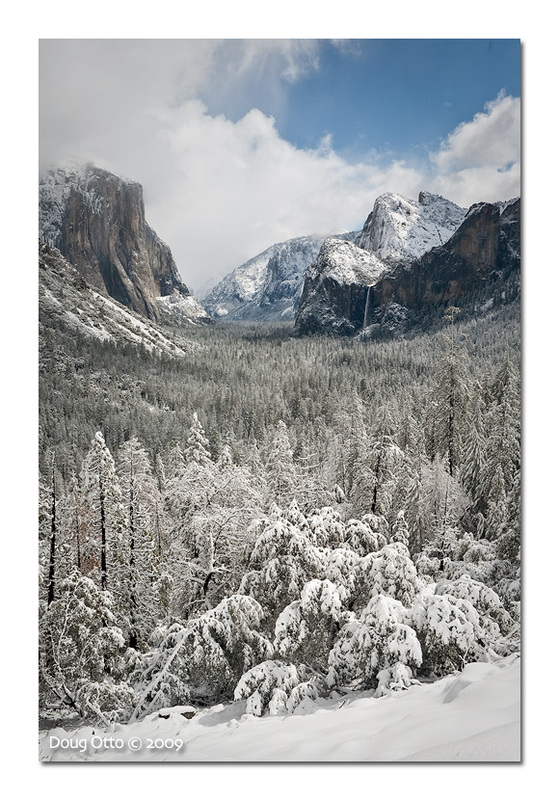 This entry was posted in Photography and tagged Bridal Veil Falls, Canon 24-70 f/2.8L, Canon 5D, clearing storm, clouds, doug otto, el capitan, snow, trees, yosemite, yosemite national park. Bookmark the permalink. Doug… awesome image with a really nice color palette. Enjoyed the narrative, and the absolutely stunning view. Never get tired of Tunnel View, and your take on it here is special.